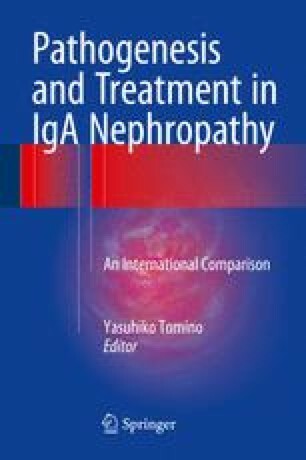 IgA nephropathy (IgAN), a frequent cause of end-stage renal disease, is an autoimmune disease wherein immune complexes consisting of IgA1 with galactose-deficient O-glycans (Gd-IgA1; autoantigen) and anti-glycan autoantibodies deposit in the glomeruli and induce renal injury. Serum IgA1 has three to six clustered O-glycans, some of which may be deficient in galactose and thus expose terminal or sialylated N-acetylgalactosamine. Patients with IgAN usually have elevated serum levels of Gd-IgA1. The mechanisms involved in production of Gd-IgA1 are not fully understood. Using IgA1-producing cell lines, we have analyzed the heterogeneity of IgA1 O-glycosylation and the corresponding biosynthetic pathways. IgA1 secreted by cells from IgAN patients vs. healthy controls had more galactose-deficient sites and overall more O-glycans. These changes were associated with differential expression/activity of key glycosyltransferases in cells from patients with IgAN vs. controls, elevated for an initiating enzyme N-acetylgalactosaminyl (GalNAc)-transferase 14 and for GalNAc-specific sialyltransferase (ST6GalNAc-II) and, conversely, decreased for the galactosyltransferase (C1GalT1) and C1GalT1-associated chaperone Cosmc. Involvement of the key enzymes in the production of Gd-IgA1 was confirmed by siRNA knockdown and biochemical approaches. Moreover, expression of these enzymes is affected by some cytokines that further enhance the enzyme imbalance to increase Gd-IgA1 production. In summary, the production of Gd-IgA1, the key autoantigen in IgAN, by IgA1-secreting cells results from dysregulation of key glycosyltransferases and is augmented by certain cytokines. These findings provide insight into possible approaches for future disease-specific therapy. This review is dedicated to our late colleague, Dr. Milan Tomana, a pioneer in the studies of IgA glycosylation and the abnormalities associated with IgAN. The authors also thank all coworkers and collaborators who have participated in various aspects of these studies. The authors have been supported in part by grants DK078244, DK082753, DK099228, DK105124, DK106341, DK079337, and GM098539 from the National Institutes of Health and a gift from the IGA Nephropathy Foundation of America.